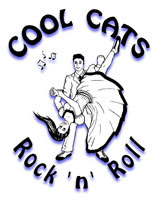 Cool Cat's aims to provide high quality structured dance lessons which concentrate on the 3 main parts of your dance. Dancing provides a number of great opportunities for younger people to engage with each other and the general community. 'Retro' dancing introduces a variety of 30's to 60's musical, dance, and fashion styles and provides a forum for interaction with preceding generations. Association with friends and mentors on a regular basis (in class and at social events) provides social inclusion in conjunction with positive role models and behavior. Dancing is a great sport and social activity that a lot of people are missing out on! Cool Cats aims to support the community, particularly youth and mental health programs, by offering FREE lessons. To promote dance development and encourage further community awareness of Retro Dance we also offer FREE lessons to youth/student dance or theatre groups. Under 16s: Provided they are accompanied by a parent or guardian (who does not need to participate if there is an other student happy to dance with the U16 participant), those under the age of 16 may join certain lessons FREE. Rules of conduct and style/progession restrictions apply, so please contact us for more details . Youth/Student Groups: If you represent a youth/student organisation, particularly if you are involved with dance or theatre, please contact us about working together to provide introductory courses and/or workshops for your members. Alternatively, if you are a member of such a group, provide proof of your current membership for a FREE introductory course. While so many community organisations are worthy of support, Cool Cats partnership programs are targeted at anti-depression initiatives and youth promotion. These are the areas in which we believe that dancing, whether as a sport or social activity, can provide the greatest assistance. A variety of options are available, providing immediate and ongoing support for both individuals and organisations. If you represent a community organisation focused upon providing services for youth or promoting mental health and would like to explore how Cool Cats partnership programs may be tailored to suit your needs, please do not hesitate to contact us. We may not always be in a position to meet your specific desires (e.g. availability for workshops or performance at an event), but we are eager to help if we can. Mental Health Organisations: Workshops and demonstrations for are typically FREE, subject to instructor and venue availability. Discounted rates are available for other not-for-profit groups.